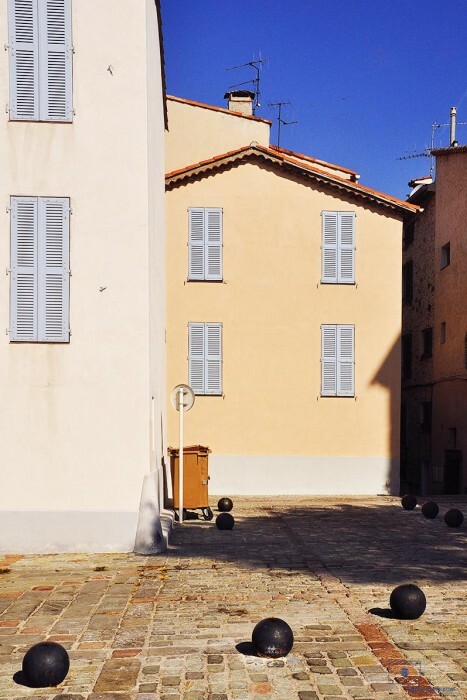 Urban landscape photograph of homes in the old part of Antibes, France. The early morning Cote d’Azur sunlight provides a warm feel to the sleeping town. Pale blue shutters and the deep cobalt sky afford a color counterpoint to the yellows and tans of buildings and bricks. Cannonballs, in the foreground of the picture, affixed to the bricks, harken to the time when artillery would have been placed on the town wall facing the Rivera coast. The cubist atmosphere, that pervades this part of Provence, is evident here in the cascading rooftops and askew building walls.